T-slots can be very useful where it is necessary for two parts of a mechanical system to rotate relative to each other but can be clamped securely together at any angle. It is not possible to use this if the two parts have to rotate whilst a large force is being applied to them. In this case a circular dovetail is probably more suitable. One common example of the use of a circular T-slot is that used for mounting the top slide of a lathe onto the cross-slide. It can, however, be used in many other situations where two parts have to be able to rotate and then be clamped rigidly together. The t-slot is in the top, round part. In this case, the “T” is in the upright position. If the top slide is taken off and turned upside down it is possible to see the T-slot. The heads of two T bolts fit in this T-slot. They go through holes in the top of the cross-slide and end in the slots cut in the side of the cross-slide as can be seen in Fig. 2. A nut fits in each of these slots and is bolted onto the T-bolt on either side of the cross-slide. From here on the way this is used will set the way this is described in the rest of this article. The “bottom” surface, of the round part, which is shown in Fig. 3, is the bottom. The advantage of this mechanism is that the top part can be rotated by any angle relative to the bottom part. Usually it is important that the two parts can be turned relative to each other by a precise angle. For this to work it is essential that the two parts rotate about a common axis with negligible play. On the top-slide/cross-slide joint of the lathe this is usually done by having a spigot fitted in the center of the lower part and a hole to take this spigot in the upper part. This hole can be seen right in the middle of the bottom of the top slide part shown in Fig. 3. 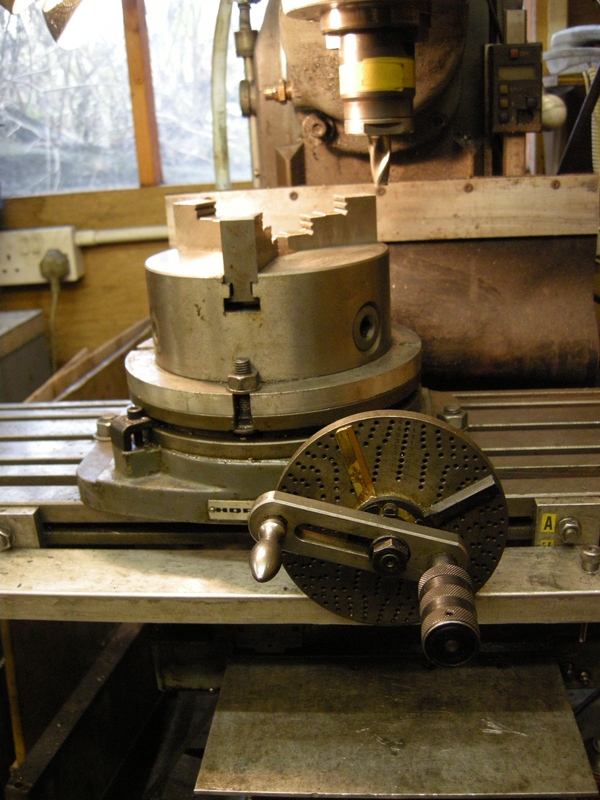 When a T-slot is used as on a lathe it is usual for the bottom of the round part to be graduated in degrees. There is a fiduciary mark on the cross-slide so the angle of rotation can be measured. Those people who have a device for marking graduations on a workpiece in the lathe would graduate this part at this point. It is then parted off. If the finish of the surface is not good enough from parting off, the workpiece can be turned round in the chuck and the parted surface turned flat. 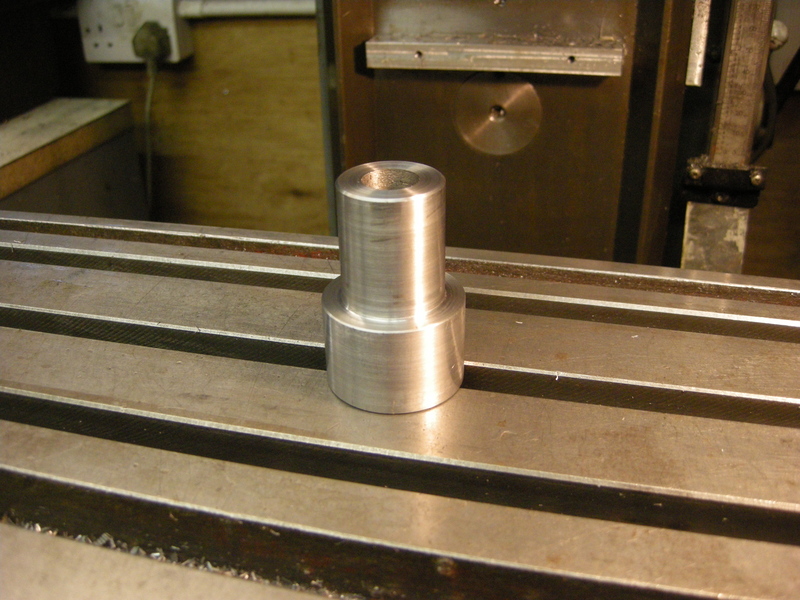 It is now ready to have the T-slot milled on the milling machine. The same is done for the bottom part. It is essential that both parts have the same diameter. If the part is small enough it can be held using a three jaw chuck mounted on a rotary table. The chuck is mounted on a backing plate. This is wider than the chuck and has slots on opposite side that are used to clamp it to the rotary table as can be seen in Fig. 4. In this case the chuck and the rotary table must be centered. This can be done centered using a spigot as shown in Fig. 5. This spigot is actually used the other way up. The small end fits the hole in the rotary table. The big end fits the hole at the back of the chuck. The only other alignment problem is the distance of the center of the chuck from the axis of the spindle. This will determine the radius of the T-slot. In many cases this can be measured with a ruler. If it is important that this is accurate then the chuck can be aligned with the spindle as follows. The rotary table/chuck pair is sitting loose on the milling table. 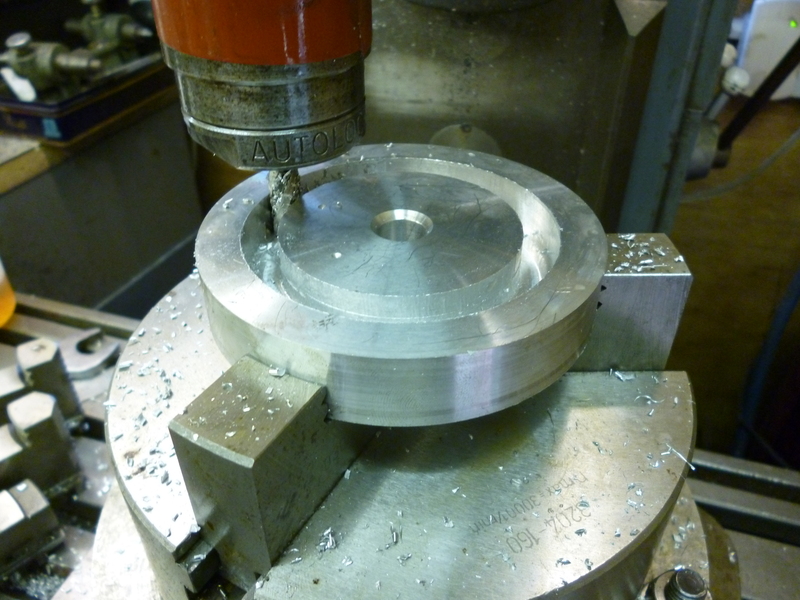 A spigot is fitted in the milling chuck. The rotary table/chuck are moved so the other end of the spigot can be tightened up in the chuck. The milling table is moved so the rotary table/chuck can be clamped to the milling table. At this point the rotary table/chuck pair is aligned with the spindle. The milling table is locked in the y direction. The chuck is loosened. The spigot in the milling chuck is removed. 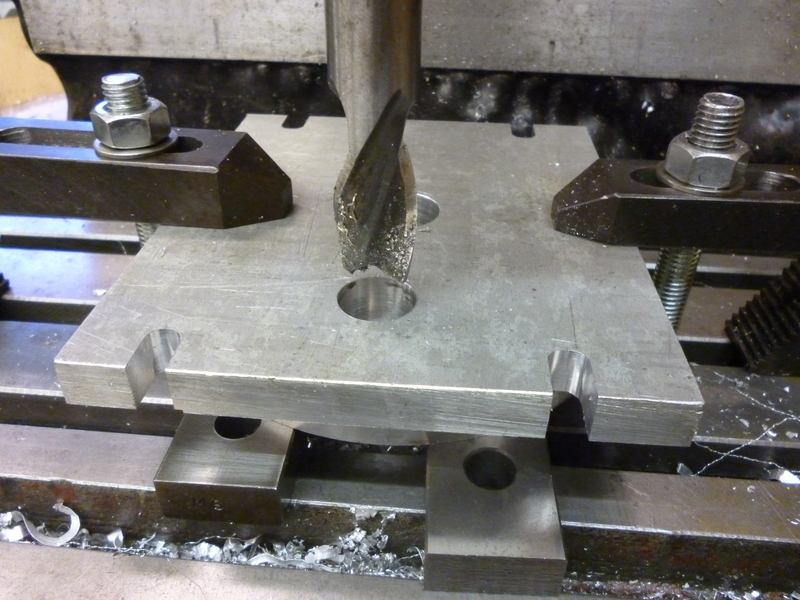 The milling table is moved in the x direction by the radius required for the center of the T-slot. The milling table is now locked in the x direction. For the cutting of the actual T-slot the x and y positions do not change. However a note should be made of them since is necessary to make some slight movements of the table as will be seen later. In either case the “bottom” of the workpiece is now upwards. A slot drill is used to cut the body of the T. This will define the width of the T-slot. 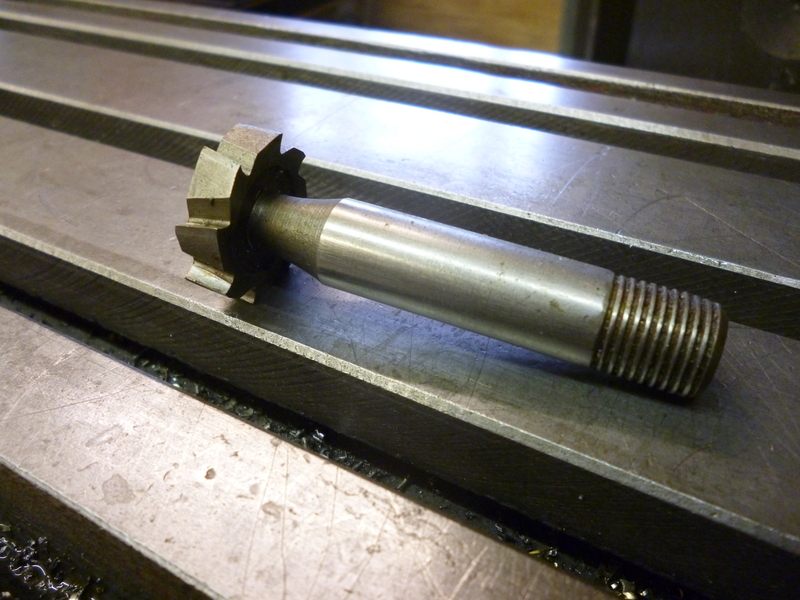 It will need to be slightly bigger than the diameter of the bolts that will be used to bolt the two parts together. This is done first for whichever of the following methods is used to do the rest of the job. There are, of course, standard sizes for T-slots. Most T-slot cutters are designed to make a T-slot of a standard size. The slot has to be wide enough to take the narrow part of the shank of the T-slot cutter. The depth of this slot is such that it touches the bottom of the T-slot. The cross part of the T has to be cut with a T-slot cutter. Notice the shank has two different diameters. Only the narrower part is meant to fit the T-slot. The wider part is outside the surface of the workpiece when cutting the T-slot. What might seem to be a T-slot cutter but which has a curved shank is not a T-slot cutter. It is a cutter for cutting keyways for woodruff keys. These are totally unsuitable for cutting T-slots. With a circular T-slot there is no end of the slot into which the cutter can be inserted. There are three ways of dealing with this. If the angle through which the two parts rotate is small enough then it is possible to cut a hole in the middle of the T-slot to take the T-slot cutter. An example of this can occur on a milling machine where the milling table rotates, but by not much more than 45° in either direction. An example of this is shown in Fig. 8. Figure 8 shows the top surface of the knee assembly of the milling machine. The milling table has been lifted up above and the bottom of it can just be seen at the top of the Fig 8. This is an example of where the T-slot is used the opposite way up to the T-slot used on the lathe. In this particular case the graduations are on the same surface as the T-slot. The problem with this method is that if the two parts can rotate by any angle then, at some point, the head of one of the T-bolts will slip into this hole. It will not fall out because the far end of the bolt has nowhere to go. But it does mean that the rotation of the two parts can “catch” when either of the bolts passes the hole. The second solution is to cut a hole on one side of the T-slot. This is just big enough for the T-slot cutter to get in. The bolt cannot fall through because it is constrained by the position of its shank in the hole in the lower part. The rotation is much less uneven but it is still is not perfect. This is can be seen in Fig. 3. This is the top slide of the lathe shown the “wrong” way up. The third solution is to cut a hole for the T-slot cutter in what is the “top” surface. At this point only the slot for the shank of the T has been cut and it is facing upwards. 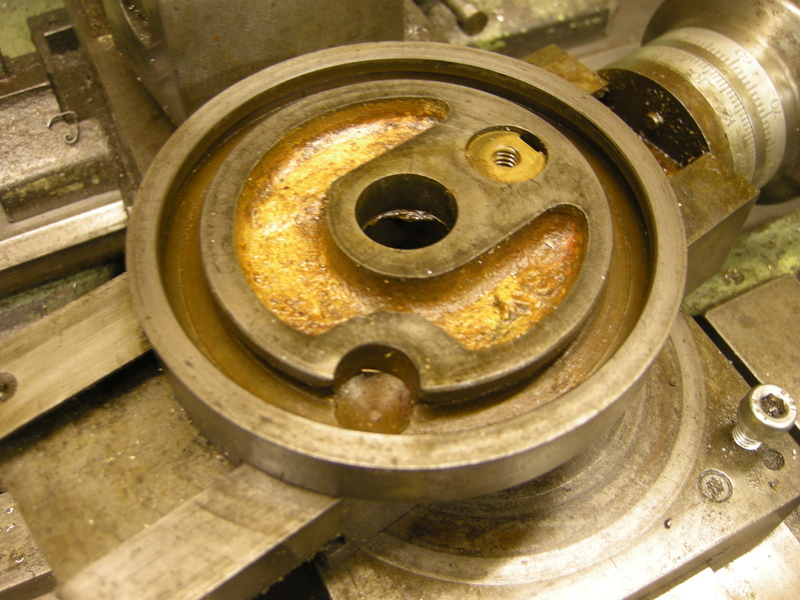 The workpiece is taken out of the chuck and put back in but the other way up (the “right” way up – the way it would be on the lathe). A hole is cut using a slot drill centered on the slot on what is now the top side. The hole is centered with the center line of the T-slot. This slot has to be big enough to take the wide part of the T-slot cutter. But the width of the T-slot cutter could well be bigger than any available slot drill. The hole cannot be bored because there is not enough height for a boring head in this case because of the height of the rotary table/chuck. The hole can be “enlarged” just by moving the workpiece around and using almost any size slot drill.. (This is where the table might need to be moved around by a small amount as mentioned earlier). This hole does not need to be perfectly round or accurately positioned. After having done this the table is moved back to the original x and y positions. It is not possible to cut this hole with a T-slot cutter even though it appears to have cutting edges on its end. When this part is used the circular T-slot nuts will have to be fitted in using this hole. The slot drill is removed from the milling chuck. 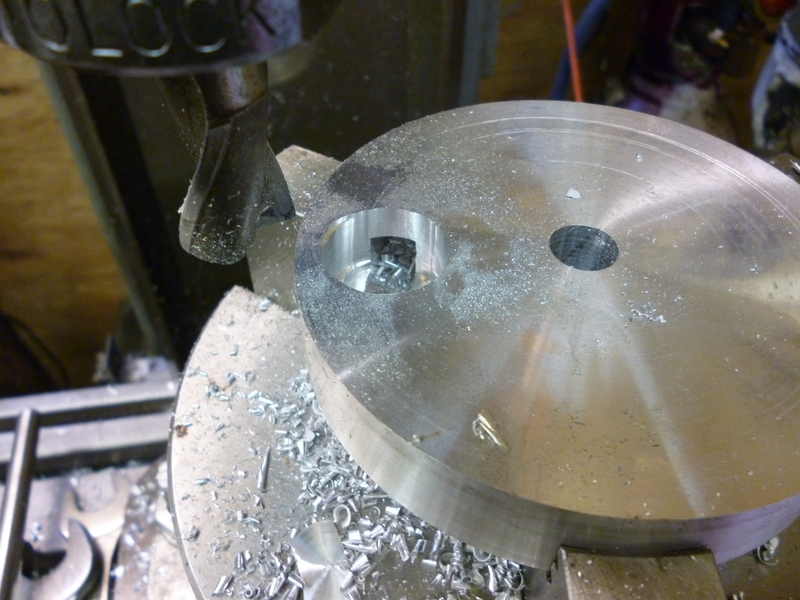 The collet in the milling chuck is changed for the one needed to hold the T-slot cutter. The workpiece is taken out of the chuck. The narrow part of the T-slot above the hole is slightly widened using a file so it is just wide enough to take the wide part of the shank of the T-slot cutter. Any swarf is cleared off the workpiece and the chuck etc. T-slot cutter is put shank first into the big hole and then through the widened part of the T-slot so it comes out on the other side. 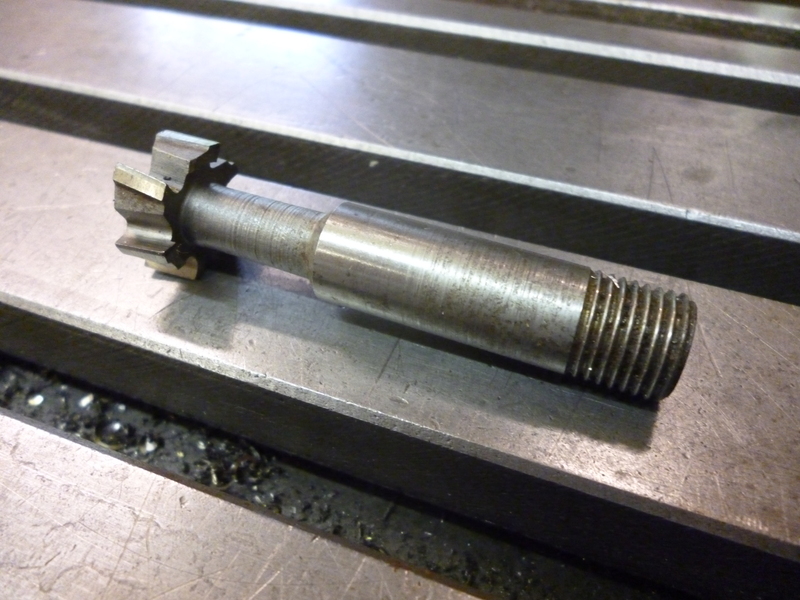 It is then screwed into, or just fitted to, the collet in the milling chuck. 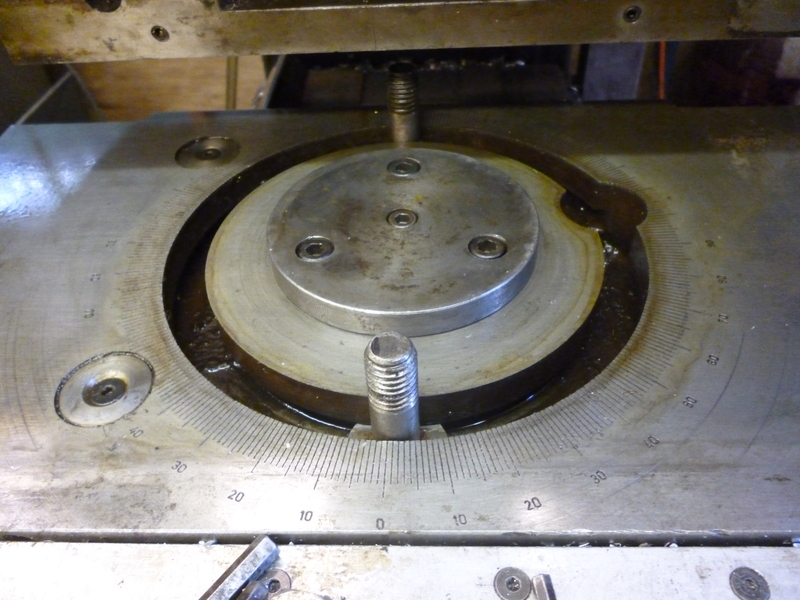 The work piece is then fitted into the chuck on the rotary table and this is tightened up. It should fit without having to move the milling table at all. The T-slot cutter is tightened up as well as possible with the fingers and then with a open ended spanner or failing that a mole wrench. (The usual spanner might not be useable because the workpiece is in the way.) The height of the milling table will have to be set so that the bottom of the cutter touches the bottom of the T-slot at the same time as the bottom of the workpiece sits on the jaws of the chuck properly. If necessary, the rotary table can be moved slightly so that the shaft, i.e. the narrow part, of the T-slot cutter is just clear of either side of the slot. 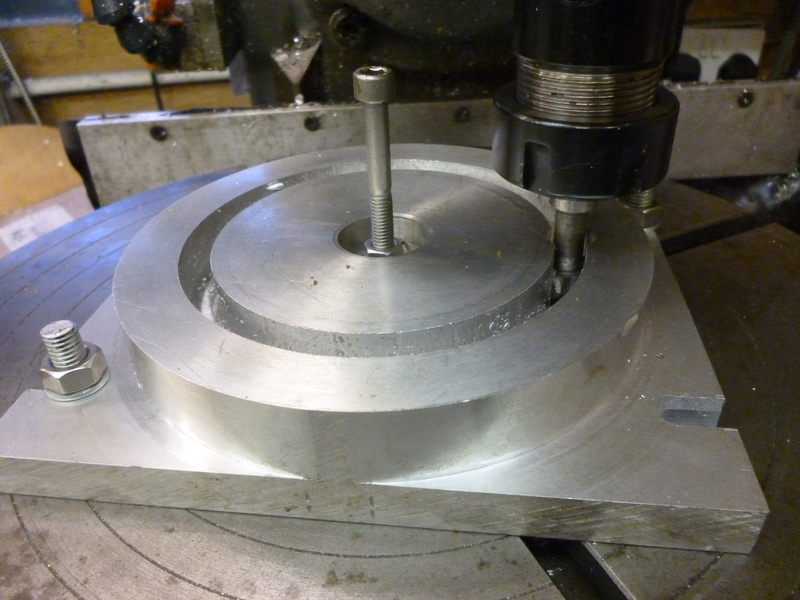 The rotary table is now rotated so the T-slot cutter can cut the top of the T all of the way round. Fig. 10 cutting the top of the T (582). Notice that the hole the cutter was put through is now on the underneath. 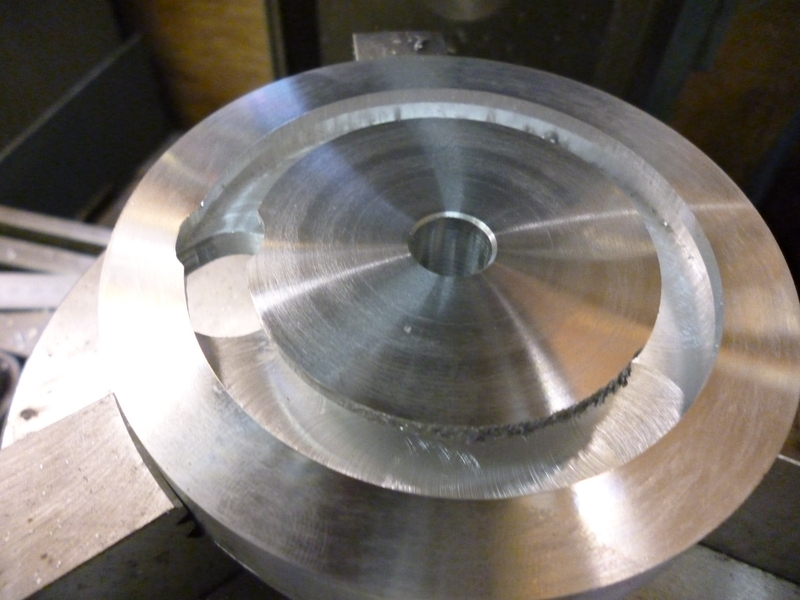 When the cutting is complete, the chuck is loosened so the workpiece is free and the milling table lowered. 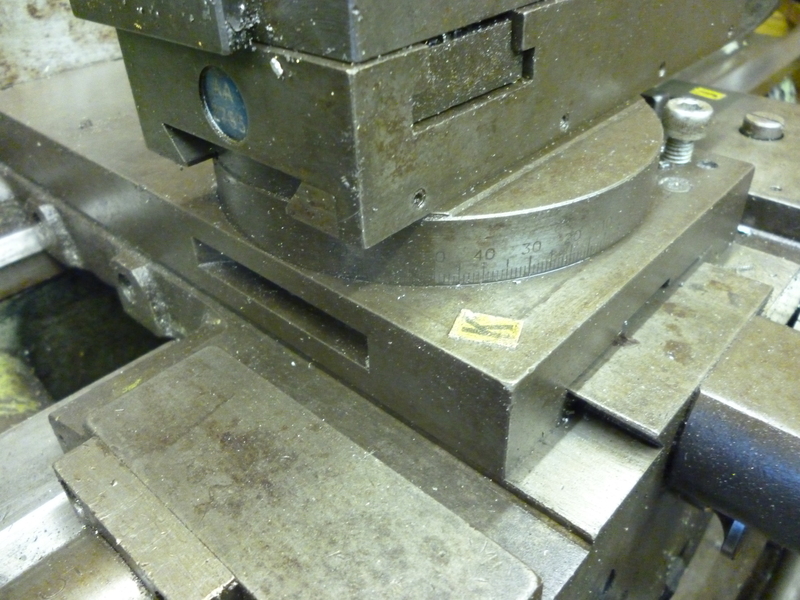 The workpiece is now floating and is being held simply by the T-slot cutter. This has to be removed to free the workpiece. The finished workpiece is shown in Fig. 1. It is shown in the chuck but, of course, it had had to be taken out to remove the cutter. If this was for a top-slide then it is being shown the wrong way up. The slot that forms the shank of the “T” is clearly shown. The hole for the cutter can be seen on the underneath on the left. Just above this hole can be seen the slight widening of slot in order to take the shank of the cutter. When this is turned the “right” way up there is, of course, a hole in the top. But invariably this part will have some other part fitted to it. It would usually be possible to mount this other part in such a way as to cover this hole. Since writing this page another circular T-slot has been made. Doing this made me think there were some points that had been overlooked previously. Firstly any part with a circular T-slot in it is usually made to made another part. It is essential that the two touching surfaces do touch properly. This leads to the following. two parts must rotate about a common axis. Al so, for the two parts to touch properly all over the mating surfaces these surfaces must be at right angle to the axis of rotation. For the scale on one to meet the fiduciary mark on the other the diameters of both parts must be the same. If the two parts rotate to set an angle then when the angle is achieved it will be necessary to clamps the two parts together. The most obvious way of doing this is the method often used to hold the topslide on a lathe to the cross slide. One part will need a scale in degrees. This might only be necessary to do, say, from 0-180. But should the requirement change or the parts used for something else it might be useful to graduate it from 0-360 straight away. The other part might need only one fiduciary line. alternatively it could be graduated with a vernier. Where this fiduciary line needs to be might vary. In this case it can be a small scale the can be moved round the part by a small amount. Thank you very much for the posting, solved my problem.